The Royal Air Force Museum Cosford will be holding a Remembrance Service paying respect to those Service men and women who made the ultimate sacrifice during their tours of duty. For those wishing to pay their respects, the Museum will be holding a Service of Remembrance on Sunday 10th November, allowing visitors to reflect on the sacrifices made by our brave service men and women. The service will be led by Rev (Sqn Ldr) Eddie Wynn RAF Reserve, Station Chaplain RAF Cosford, in front of the Comet. During the service there will be readings by Commander Jon Milsom RN COS DSAE and Dave Leek, Chairman of the Aerospace Museum Society. Visitors to the Museum will also be treated to performances from the Cosford Military Wives Choir, who will perform for visitors at the beginning and end of the service. All visitors to the Museum are welcome to join the service for this Act of Remembrance and are politely requested to assemble in Hangar 1 no later than 10:30am ready for the Service to commence at 10.45am, which will include a two minute silence with the sounding of ‘The Last Post’. Sunday 10th November also marks the first day of the annual Conservation Centre Open Week where visitors can view the conservation work taking place on a variety of aircraft and speak with the skilled Technicians and Apprentices who make the work possible. The Conservation Centre will be open to all Museum visitors from 10th to 16th November from 10.15am to 1.00pm. The Museum is open daily from 10am and entry to the Museum is FREE. For further information, please call the Royal Air Force Museum, Cosford on 01902 376200 or visit the Museum website, www.rafmuseum.org. 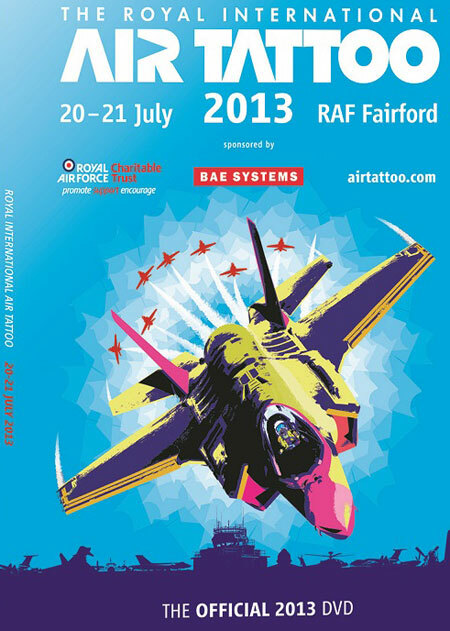 AIR TATTOO DVD OFFERS THRILLS AND MORE! RE-LIVE all the thrills and excitement from one of this year’s greatest aviation events with the Royal International Air Tattoo’s official 2013 DVD featuring exclusive interviews, dramatic in-cockpit footage and a fascinating glimpse behind-the-scenes. From fast jets and vintage warbirds to aerobatic display teams and role demos, the official Royal International Air Tattoo 2013 DVD is a must-buy for aviation fans of all ages. Also included is footage of three memorable flypasts: the RAF Red Arrows alongside a giant British Airways’ Airbus A380; the Red Arrows with an Airbus Military A400M ‘Atlas’, plus a commemorative flypast by the BBMF Lancaster and an RAF Tornado GR4 from 617 Sqn, to commemorate the 70th anniversary of the legendary Dambusters’ Raid. Filmed in High Definition and featuring multiple camera angles, including on-board and on-wing footage, this year’s official DVD, produced by The Media Group, features the pick of the action from the world’s greatest airshow held at RAF Fairford in the Cotswolds. Around 130,000 people headed for RAF Fairford this summer and were entertained by more than 230 aircraft from 27 air arms representing 19 nations from as far afield as Brazil, Estonia and Jordan. Among the many highlights were displays by the Polish Air Force MiG-29, Hungarian and Swedish Air Force Gripens, French Air Force Rafale, RAF Typhoon and the Italian Air Force C-27J Spartan. Warbird and vintage aircraft enthusiasts were rewarded with displays by Avro Vulcan XH558, Plane Sailing’s PBY-5A Catalina flying boat, Classic Air Force’s Gloster Meteor T7 and Red Bull’s B-25J Mitchell and Vought F4U-4 Corsair. Special Under The Radar features turn the spotlight on Boeing Stearman pilot Tracey Curtis-Taylor, who is planning to recreate Mary Heath’s historic 1928 Cape Town to London flight and the teams behind Canberra XH134, Vulcan XH558 and RAF Live! The DVD also includes interviews with a wide variety of participants, supporters and organisers including Air Tattoo co-founder Tim Prince, the Patrouille de France, the Red Arrows, the Flying Bulls and Air Tattoo Honorary Vice Patron Sir David Jason. Also featured is a tanking demo flypast by an Italian Air Force KC767 and two typhoons plus a special Eurocopter UK emergency services demo illustrating the role helicopters play in bringing specialist equipment and people rapidly to a scene. Sold in support of the Royal Air Force Charitable Trust, the official RIAT 2013 DVD is priced £16.95 and can be ordered online at www.airtattoo.com or by calling 0800 297 1940. A two-disc Collector’s Edition, featuring extended highlights as well as arrivals and departures, is also available, priced £24.95. Both are also available on Blu-Ray. If you’re searching for that particular gift which will make their spirits soar once they have ripped open the wrapping paper on Christmas Day morning, why not visit the Royal Air Force Museum’s online shop – www.rafmuseumshop.com? For Christmas 2013 the Museum has substantially expanded its gift range to suit a variety of budgets including its jewellery and clothing ranges. We have revived the classic children’s game of the 70s and 80s, Top Trumps, by creating a pack dedicated to our aircraft collections at both London and Cosford. Containing 30 beautifully photographed aircraft, 15 from each site, this game of skill is highly addictive and will have young aviation buffs trying their best to outwit each other on Christmas Day for just £5.99. 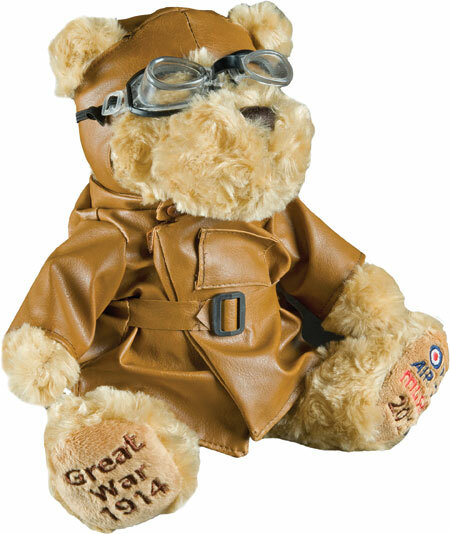 Little Pilots aged a year or below will adore our range of RAF Airman Body Suits and T-Shirts. Made from 100% cotton, for delicate skins, these items are fully machine washable and perfect for fancy dress, themed events or for when your future pilot needs to express themselves. This quality printed garment is the perfect gift for any child at £9.50 each. Back by popular demand, we have expanded our range of hand painted Christmas Tree Baubles by introducing the RAF Stripe Bauble, a perfect complement to our Roundel and Historic Aircraft Baubles. Individually created, these intricate works of art are designed by the artist expertly hand painting each image, using the hole at the top of each bauble. Beautifully gift-boxed, these baubles are the perfect decoration for any aviator’s Christmas Tree at just £5.99 each. If you’re searching for that gift that will stand the test of time we are now able to offer a Royal Air Force Skeleton Pocket Watch for men for £70.00 and Ladies Pendant Watch for £45.95. Both of these charming time pieces are fashioned from pewter by British Craftsmen and feature the Royal Air Force’s Crest as part of their design. The perfect ornament for any smart individual these timeless watches will become much loved heirlooms. We also offer a personalised engraving service to make these gifts even more special. For the man who has everything what better present to give than an Escape & Evasion Map Tie? These ties are made from genuine issued escape and evasion silk maps from the Cold War period (circa 1949 -1960). Easily concealed upon the person, these maps were used to assist servicemen in their attempts to escape or evade capture if shot down behind enemy lines. These unique ties are lined with blue silk and come presented in a Home Front style gift box with an information sheet about the map depicted – all for £85.00. If your budget is able to extend a bit further, we are also able to offer original Irvin Sheepskin Flying Jackets for £609. Made from top quality, supple sheepskin with a long rugged wool interior, the Irvin Sheepskin Flying Jacket became the definitive flying jacket from pilots during the Second World War. Today they are still manufactured in the United Kingdom to the same fastidious attention of detail demonstrated by Leslie Irvin, their creator, and bear the authentic Irvin, woven label. The perfect addition to any aviation enthusiast’s wardrobe the Original Irvin Sheepskin Flying Jacket comes in a variety of sizes suitable for both men and women. Furthermore, by purchasing any of the items contained from our online shop you will be helping the Museum maintain its unique collection of aircraft, medals, films and documents – preserving a vital part of our nation’s heritage for future generations. So this Christmas why not give your personal high-flyer a gift that will make their Festive spirits soar whilst at the same time making a donation, through your purchase, to our nation’s aviation heritage? On Friday 18th October 2013 the Wings & Wheels team was delighted to be presented with a Help for Heroes, Hero award ‘For Outstanding Support To Our Wounded’. Along with 30 other nominees, the team visited the Recovery Centre at Tedworth House in Tidworth, Wiltshire for an evening of contemplation and celebration. Over the last five years Wings & Wheels has supported the fundraising efforts of the charity by helping to raise awareness and money as well as inviting members of the Band of Brothers and Band of Sisters to enjoy the press launch and Show. The Help for Heroes, Hero Awards were started in 2010 when Bryn and Emma Parry, co-founders of the Charity, wanted to recognise those fundraisers who had gone “above and beyond” in support of Help For Heroes. The Awards are treated like “The Victoria Cross” for the charity, not necessarily based on the amount of money individuals raise, more a reflection of the style, commitment and dedication of their support. In an ideal world, Help for Heroes would want to award everyone who has ever done anything for the charity but it just isn’t possible. Therefore, it was agreed that throughout a calendar year the Charity would nominate people for their outstanding achievements and in August of that year the list would be presented to the co-Founders to select a maximum of 50 winners who would be presented with a Hero Award from the President and Trustees of Help For Heroes at an awards ceremony, normally held in October. Autumn is off to a flying start at the Royal Air Force Museum Cosford with the arrival of a Focke-Wulf Fw 190 A-8. These German fighter aircraft were widely used by the Luftwaffe during World War Two and an example of this is now on display to visitors within the Museum’s Warplanes collection. The Focke-Wulf Fw 190 was a single-seat single-engine multi-role fighter-bomber, capable of carrying a larger bomb load than its counterpart the Messerschmitt Bf109. Entering Luftwaffe service in August 1941, the Fw 190 proved superior in many respects to the Royal Air Force’s main frontline fighter, the Spitfire V. It took the introduction of the much improved Spitfire IX in July 1942 for the RAF to gain an aircraft of equal capability. One of the more unusual roles for the Fw 190 was as part of the twin-aircraft drone combination, code-named mistletoe or Mistel. A single engine fighter was mounted on top of a twin engine bomber, and on lining up with the target the fighter detached itself, leaving the bomber, packed with explosives, to impact the target. Cosford’s Fw 190 is a unique survivor of a Mistel combination. Surrendered in Denmark in May 1945, the Fw 190 was part of a combination with a Junkers Ju 88, and assigned to a unit which trained Mistel crews. Flown to Germany as a twin combination, the Fw 190 was then split from its Ju 88 in order to be ferried to the UK for examination. The Ju 88 half never reached the UK, and it is assumed it was scrapped. The Museum’s aircraft then spent several years on display at RAF Cranwell before a short period in storage at RAF Biggin Hill. In 1986 it went on loan to Imperial War Museum Duxford where it was given corrosion treatment and after colour scheme research, was given an authentic daylight fighter scheme. Four years later, the Fw 190 A-8 was moved to Imperial War Museum South Lambeth and placed on display, suspended in their refurbished Museum. Officially becoming property of the RAF Museum in 1998 after the title was transferred by the Ministry of Defence, the aircraft remained on display at Lambeth until December 2012 when it was moved to the RAF Museum Cosford in Shropshire. After a period of time spent in the Museum’s award winning Sir Michael Beetham Conservation Centre and undergoing a small amount of maintenance work, the aircraft has now been placed on display for aviation fans to enjoy. The Museum is open daily from 10am and admission is free of charge. For more information on the Museum, visit www.rafmuseum.org or call 01902 376200. The RAF Museum is using cutting edge digital technology to share its newly acquired exhibit – the Dornier Do17 bomber – with the world. A grant of £75,000 for exhibition development from Wargaming has allowed the Museum to work with redLoop design and innovation centre to develop a brand new method of exhibiting Museum artefacts. The creation of the‘Wargaming.net Interpretation Zone’ has been funded by Wargaming, an award winning global game publisher and developer. From 16th Oct 2013, visitors to the Museum sites at London and Cosford will be able to see a fully restored, 3D, full scale, augmented reality Dornier. Visitors will be able to view this through their smart phones via the ‘Apparition: Dornier17? app. Furthermore the Museum has also tied in with organisations across the globe including; Museo del Aire Madrid Spain, Warsaw Museum of Polish Military Technics Poland, War Museum Overloon The Netherlands. Great Horwood C of E Confined School England, Canada Aviation and Space Museum, The Air Force Museum of New Zealand Museum plus the Pima Air & Space Museum/Arizona Aerospace Foundation to celebrate the launch of the exhibition. Visitors to those Museums will also be able to see the augmented reality Dorniers through their smart phones, hovering in situ. On Saturday 5th October 2013, the Newark Air Museum took delivery of its latest exhibit, in the shape of a Handley Page Victor cockpit. This particular Victor cockpit is believed to have been built as an airframe; however before being allocated a serial number it was converted by Redifon into a Victor simulator / procedures trainer. It was once used to train Victor crews at RAF Marham in Norfolk and it has been placed on long term loan at the museum. After making the short delivery journey to the museum from its previous location near Lincoln, the Victor cockpit will soon be repainted in representative markings of the type. The cockpit is internally complete and it will form a significant part of the display at the next Tribute to the V-Force event, which the museum is hosting on Saturday 17th May, 2014 at its site on the former RAF Winthorpe airfield in eastern Nottinghamshire. The Victor cockpit will also be an integral part of the 2014 Cockpit-Fest event, which is being held on Saturday 14th & Sunday 15th June, 2014.